Whether you’re a home user or part of a company which needs its employees or clients to connect remotely, RealVNC.com has several possible solutions. They are mostly tailored towards the enterprise end of remote access, offering discounts for volume purchases, although they do also offer a free version for private use. 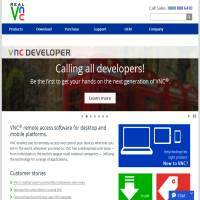 VNC doesn’t offer as many features as we’ve seen elsewhere, and it’s not as easy to use as some of the best products in this market. However, it does allow you to connect to other machines remotely from your desktop computer, laptop, a range of Apple devices (such as iPhones) or Android phone. The free edition provides remote control across platforms, as well as multi-language support. To access other machines, each package requires that they are VNC authenticated, which means they need to have registered (and potentially need to install an app or piece of software, or log in to a web browser). The “Personal” option is designed for small scale use within businesses and homes. It offers similar tools to the free edition, with additional encryption and system authentication. This makes it seem much safer and more secure, whilst also improving on the overall performance of tasks. The lack of security on the free edition is a little worrying, and does make us question whether or not we’d feel safe using it, particularly if we had private or important information which we didn’t want to be leaked. In addition, without high levels of security, your machine and data could come under attack from online threats. Still, if you’re just using the free edition to check on your home computer from your phone, or amongst a small group which you trust, it lessens this risk considerably. Personal package users can print, transfer files and chat, which makes it a much more versatile package, making the free edition feel quite limited. Upgrade to the Enterprise package and you’ll gain the advantage of being able to configure and lock down particular members or allow users to connect using ID. RealVNC isn’t always the easiest remote PC access system to use, although generally it should be fine. You need to know a user’s IP address and each machine on the network must have downloaded the VNP file or app. This makes it somewhat more secure, but can be a bit of a pain if you want to quickly connect with someone new. In essence, Real VNC seems to do a good job at the basics, particularly if you upgrade to the Enterprise package. However, its free system just feels a bit risky, and although upgrading isn’t too expensive, we do feel that you can find better value for money elsewhere. With a more streamlined, user-friendly approach, and improved security features for all users, RealVNC.com would be scoring more highly with us.